I love fall and damn do I love Vermont. So yes, you guessed it, I really really love fall in Vermont. There is something about the colors here, the sweeping panoramic views, the green mountains marking the horizon, and of course, the terrific outdoorsy people. 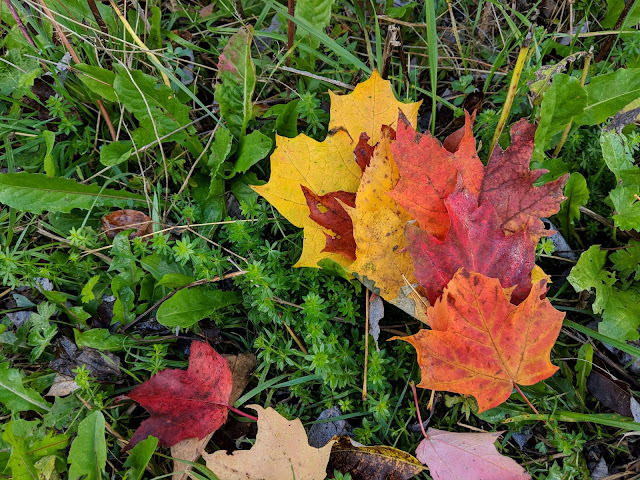 There is so much charm and color wrapped into one beautiful state that it is simply impossible to visit Vermont and not fall in love, especially between the months of September and October. Its one of those towns you visit and you say "yep, I could live here" and then you spend the next five years looking at real estate listings for properties you can't afford. Guilty as charged. 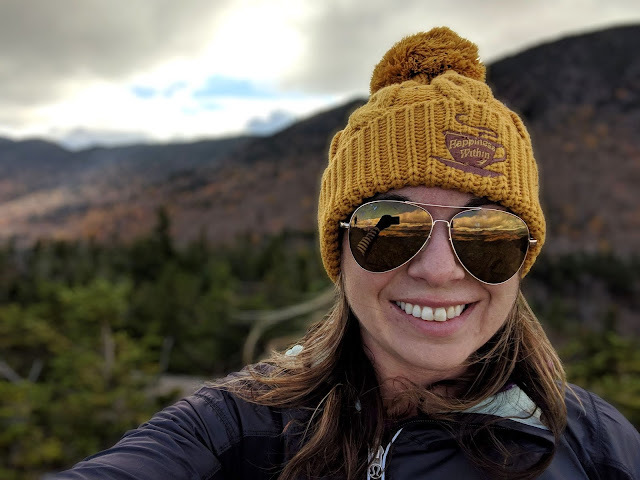 If you want to really see Autumn in New England, the best way to see fall in my biased opinion is from a mountain summits. 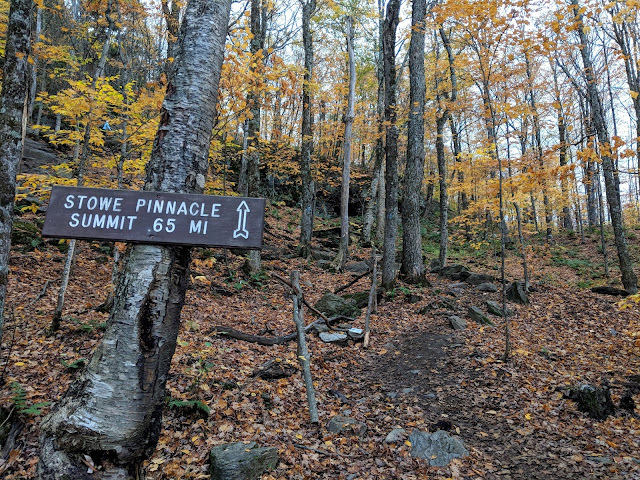 Unfortunately, those popular summits can be quite crowded in that short window us New Englanders have to leaf peep, especially if you only have the weekend. If you know me well enough (or read this blog enough), you know I hate crowds. I hate marching up a trail with what feels like 200 people and sharing a crowded summit with selfie sticks and screaming children. 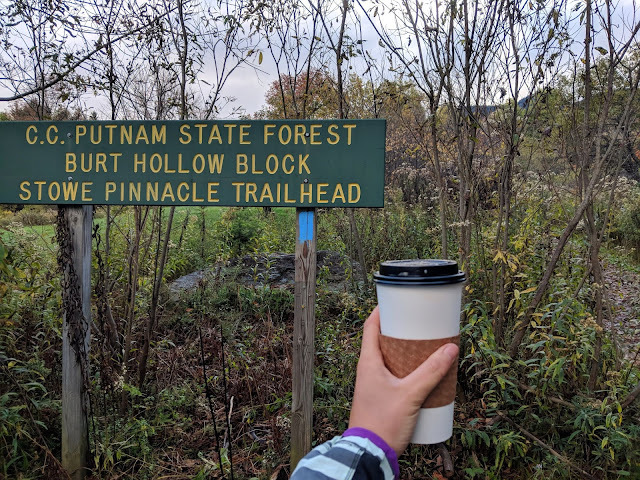 So how do I enjoy some of New England's most popular trails and also enjoy some solitude? Easy, I start early. I am a morning person through and through and I am happy to get up earlier than most to secure a parking spot at the trailhead and get a head start over the masses. So when I woke up early in stunning Stowe on a beautiful sunny fall Sunday in early October, I headed to the trail. Trailhead: Stowe Pinnacle Trailhead off Upper Hollow Road. There are several routes up but the most popular is the Upper Hollow Road trailhead. Parking: The main lot is small (less than 10 cars). 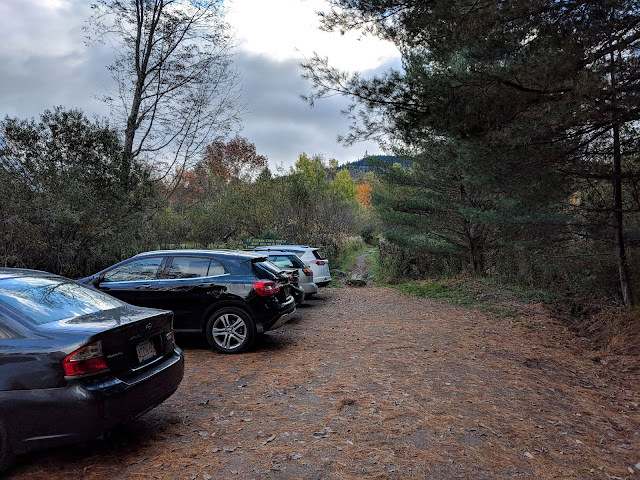 People also park along the road at the main trailhead if you want the longer hike. There is an additional lot down the road, Pinnacle Meadows. 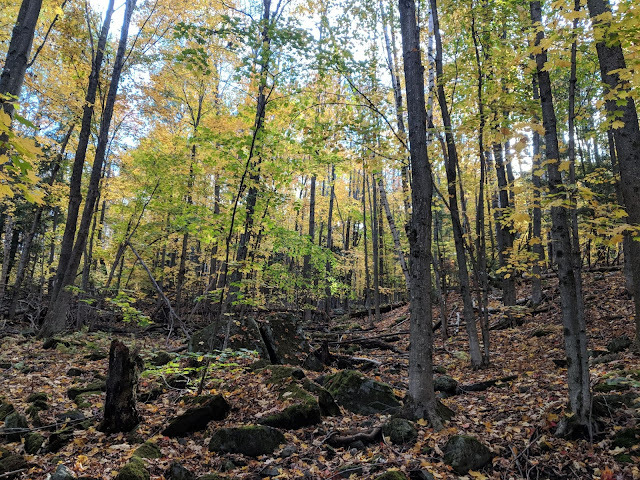 This trail intersects the main trail and also reaches the summit (it does shave off about a half mile each way so a great option if you have kids). Views: Sweeping views of Stowe below, amazing foliage. You can see views of Camel’s Hump, Mt. Mansfield, the Worcester Range, and the Sterling Range. 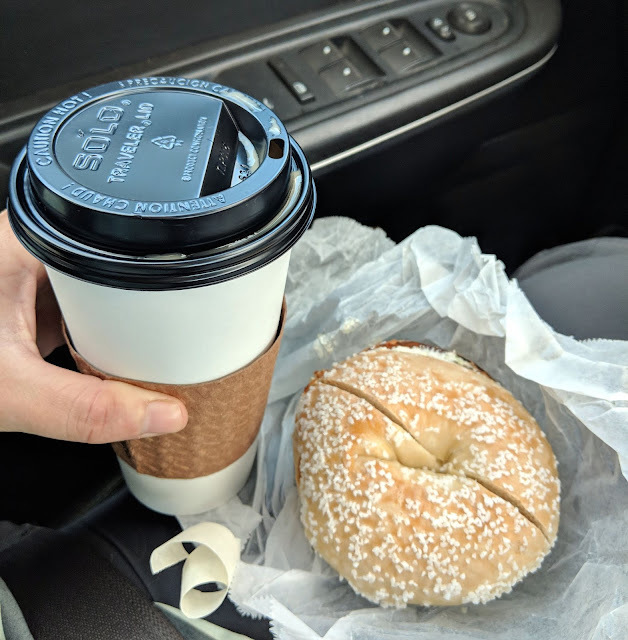 Before You Go: Grab coffee and a bagel at The Bagel in downtown Stowe. 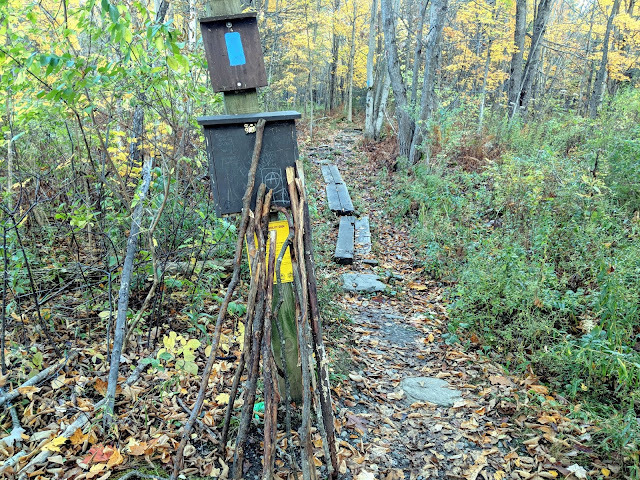 Following the blue blazed trail - hiking sticks available! A lot of people hate doing things alone (and are so afraid of being alone, but I won't start this tangent, another time friends). While I love the company of friends and family and really enjoy hiking with some of my favorite hiking pals (Hey Amanda and Ryan!) there is something to be said for hiking solo. There is a magic in being able to do things at your pace, on your schedule, wherever and whatever you want to do. I mean, I can stop and take 3,000 photos and no one is rolling their eyes at me. I can start super early without having to beg my friends to set an early alarm. There is something to be said for being comfortable being solo, especially out on a trail. 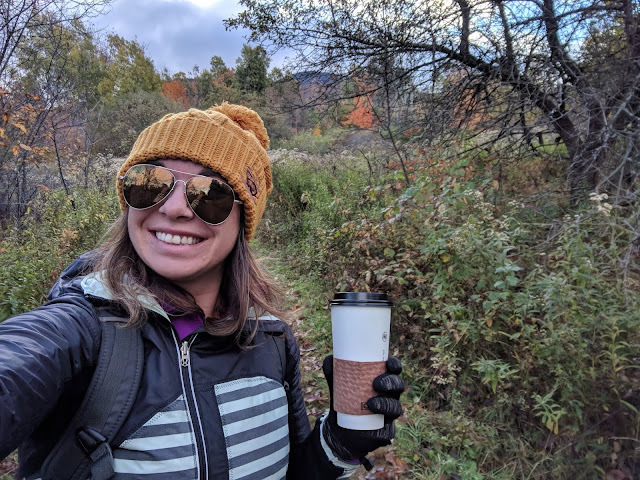 I started off on the trail before 8am with my coffee in tow. The trail follows a pretty consistent incline along a blue blazed trail. There are a few intersections and the trail is well marked with signage including distances. It was a quiet peaceful (chilly) morning, sipping my coffee as I made my way to the summit. On my way up, I only saw about 5-10 people making their way up (or down) the trail. When I arrived at the summit, there were two sweet college students from UVM and one other gentleman enjoying the view. It was nice to enjoy the quiet without the crowds on one of Stowe's most popular summits. While the golds, reds, and oranges seen from over 2,000 feet were stunning, the wind was in fact brutal. 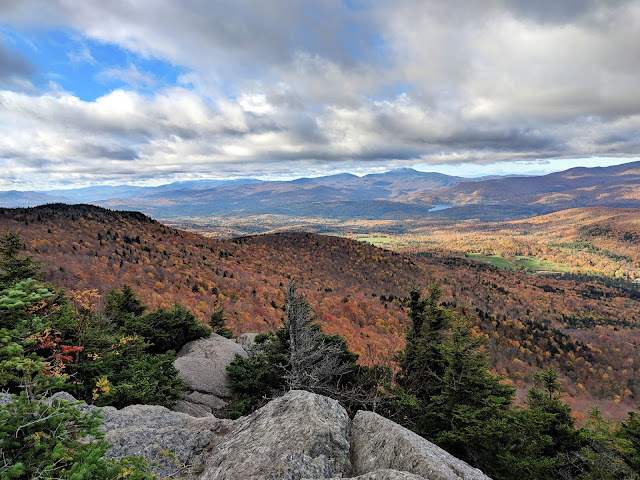 I spent about 10 minutes at the summit, taking in Vermont's beautiful fall foliage before zipping off the mountain, desperate to get out of the wind and somewhere warmer. As I made my way down the trail, the masses were started to make their way up. The trail was now quite busy with hikers making their way to the summit, several large groups included which makes passing in narrow sections a little difficult. While I love seeing people out on the trail enjoying nature, it is less than relaxing to be hiking in hoards of people. If you prefer solitude, make sure you are at the trailhead before 8 am. The trail was the perfect blend of short and sweet while still offering a little workout. Close to town, relatively easy hike, and amazing views at the summit, especially in the fall. 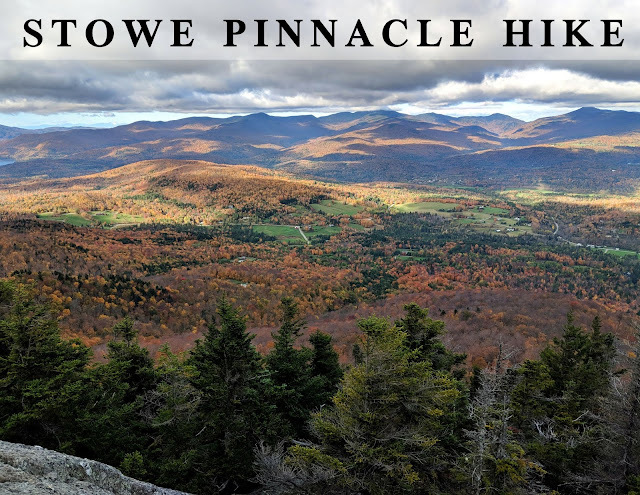 This is a great hike if you want sweeping views of Stowe with less effort than somewhere like Mount Hunger or Mount Mansfield. 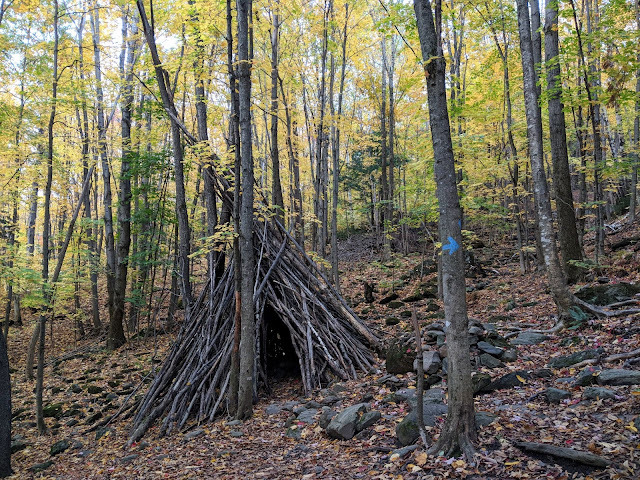 Dog-friendly and kid friendly, just a great way to spend some time outdoors in beautiful Stowe, Vermont. Looking for more Stowe Fun?